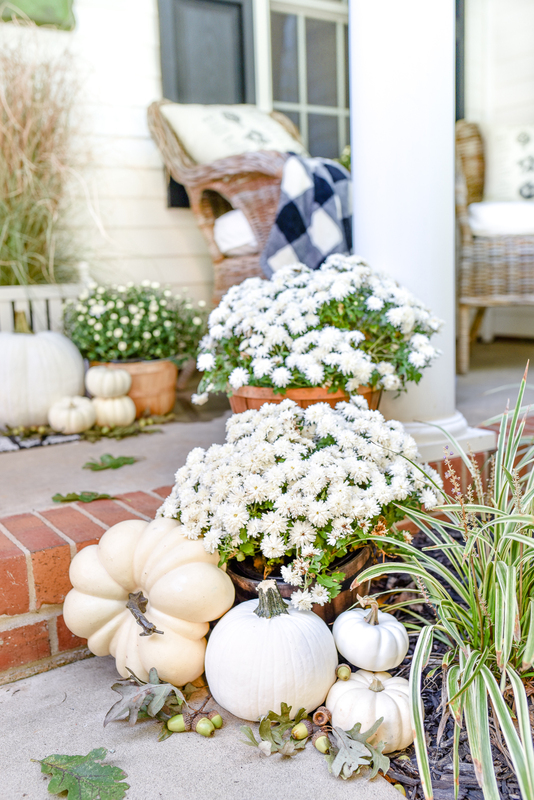 This year’s fall porch is a beautiful black and white theme with white pumpkins and white mums. 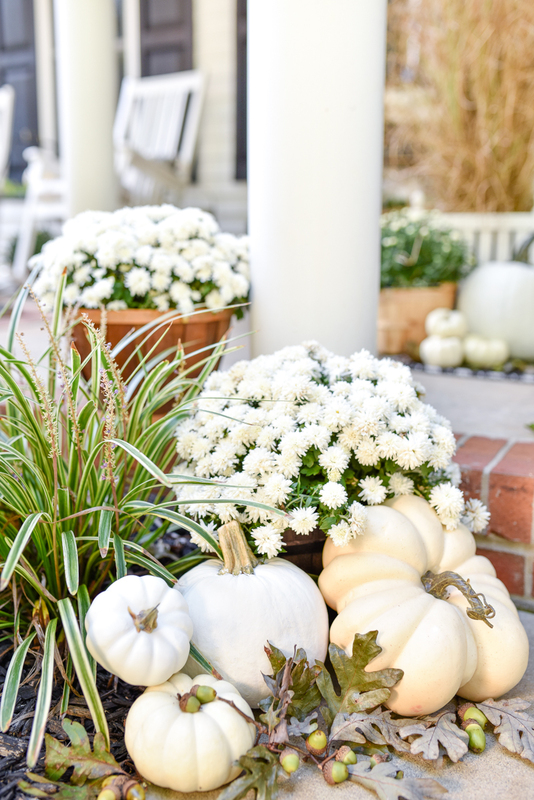 Styling my fall porch is something I look forward to every year! 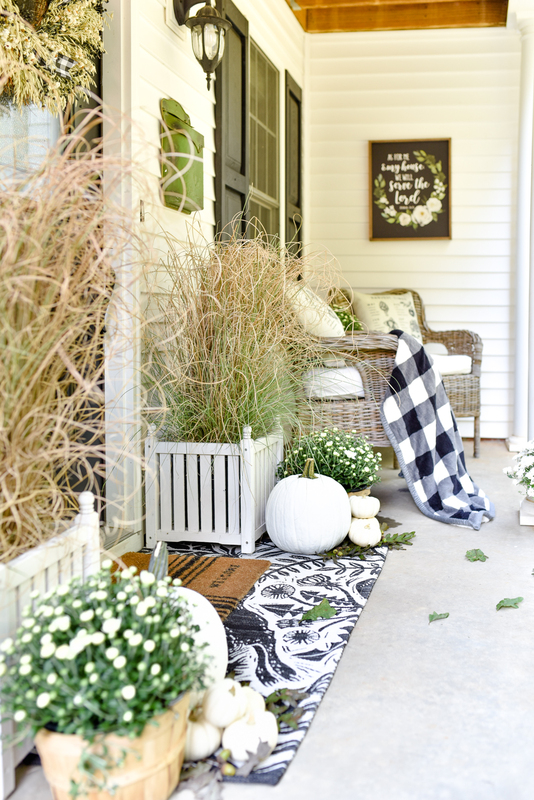 My husband calls me “Porch Queen” and it makes me giggle. 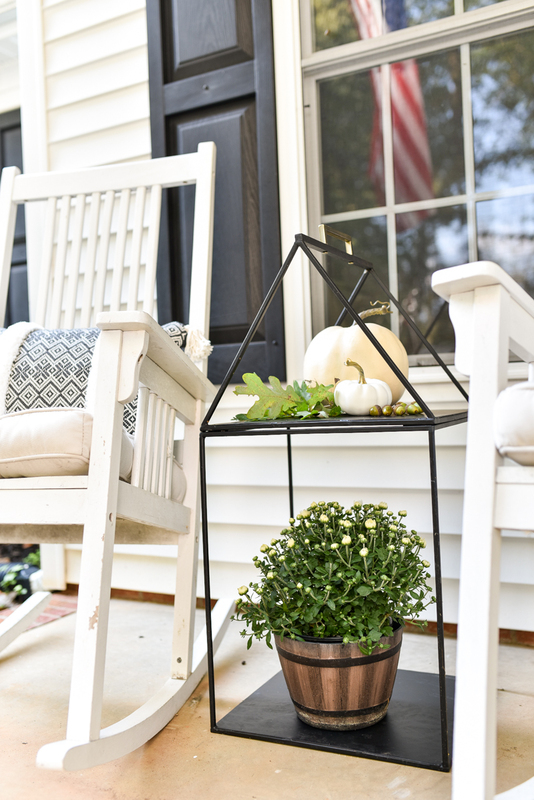 I recently shared on Instagram (please click here to follow me if you aren’t already ❤️) that I was going to keep this year’s fall porch sweet and simple. 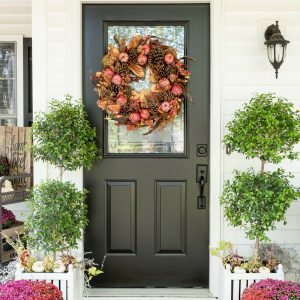 Hmmmm, 30 pumpkins, 8 mums, and lots of decor later…  You all, I have come to terms with the fact that I am just NOT a minimalist, and honestly I’m okay with that! 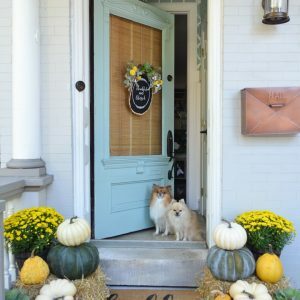 Fall is all about bounty and I love curating a beautiful porch using all the props available to me. One thing I did keep simple this year was my color palette. 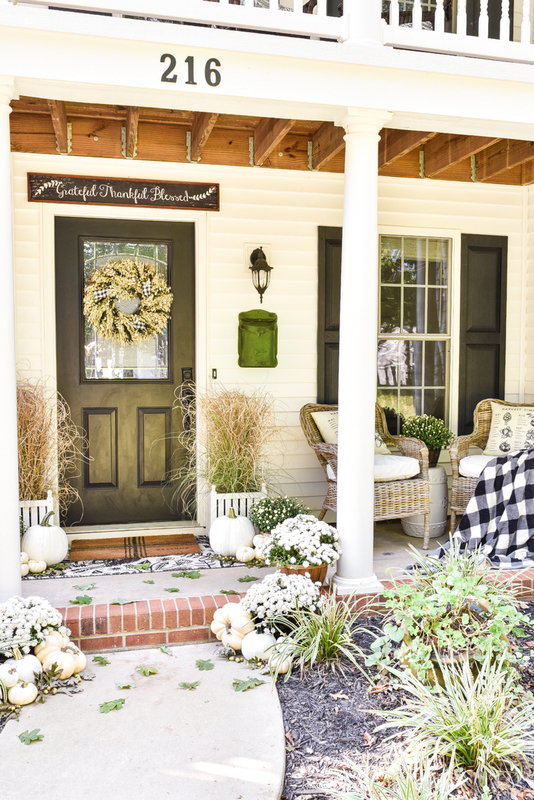 I decided to take my color cues from the exterior of our home and keep things black & white with green accents. The cute grass plants are half-dead and therefore were on clearance at Lowe’s for $5 a piece. They reminded me of corn stalks, so I was ecstatic to find them! 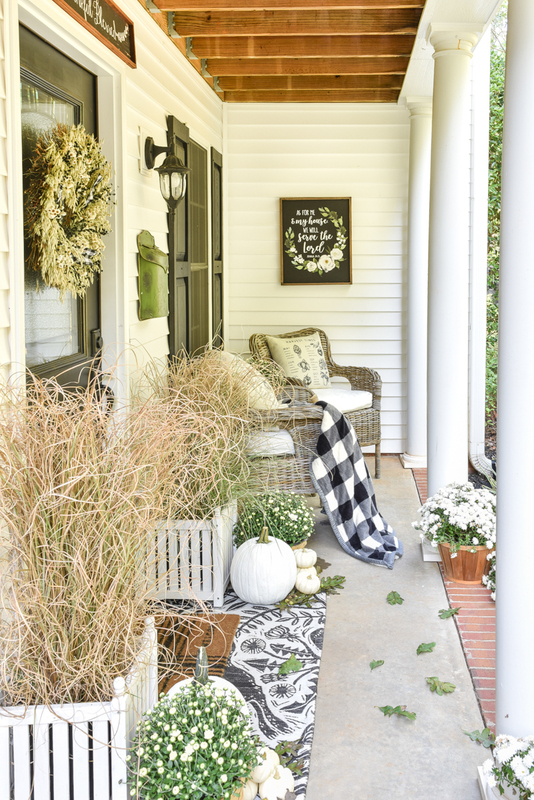 The signs are from Hobby Lobby and I love how cozy they make the porch feel. 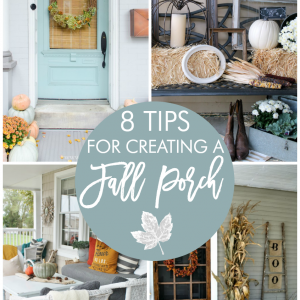 I have all of the sources for the porch listed at the end of the post with affiliate links! Scroll down if you’re looking to shop something you see here! I had a difficult time finding large, affordable white pumpkins this year. The best price I found was $9 per white pumpkin. Um…no. So I bought some $3 orange Walmart pumpkins and painted them white! This isn’t my first time painting real pumpkins. I do it almost every year. 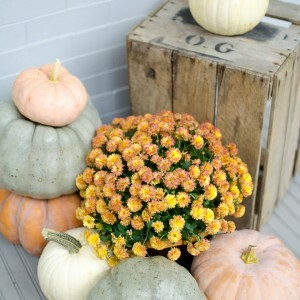 To see how it’s done, click here on How to Paint Pumpkins for all of the details! 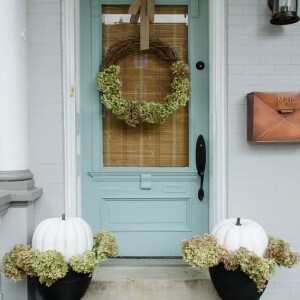 This works for both faux and real pumpkins. 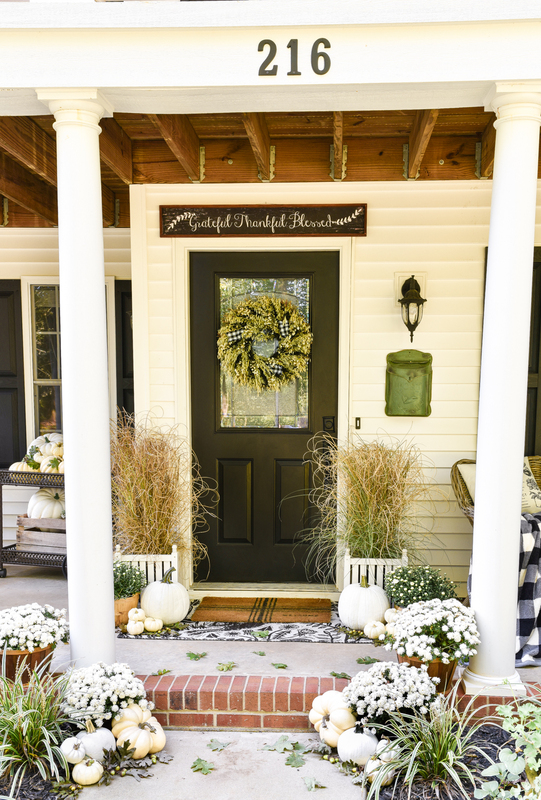 I foraged our property for green acorns and just love the texture and color they add to the porch! 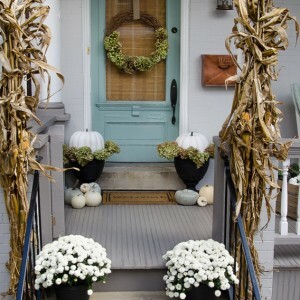 Searching your yard (or the neighbor’s) for free decor is always a good idea! 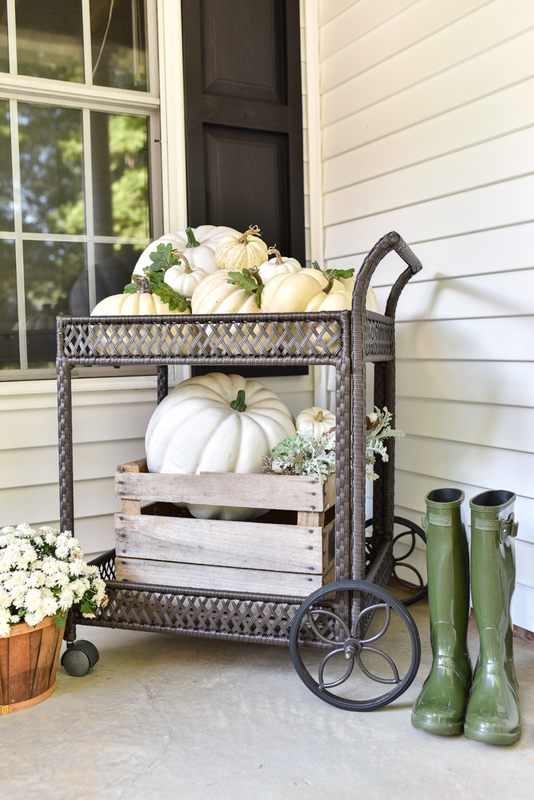 My outdoor bar cart is serving up a large dose of pumpkins this year! 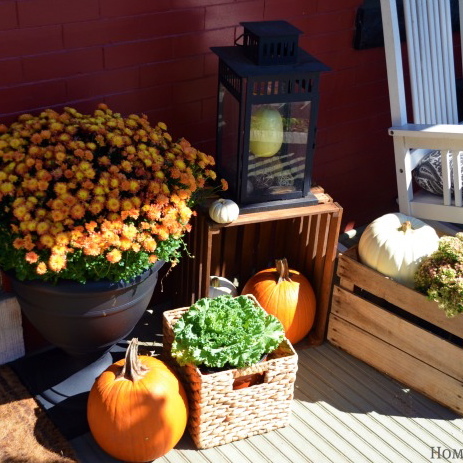 I used some green oak leaves between the pumpkins to add some color. Between the rocking chairs sits my Magnolia Hearth & Hand wood holder. I use it as an outdoor end table and it’s perfect for holding morning coffee. And since it’s still going strong in the high 80’s here in South Carolina, here is some southern living humor for you! Listed below are all of the sources for this year’s porch! Click on the pictures or links to shop the items that interest you.